ZIMBABWE – President Robert Mugabe keeps files on all of his ministers’ peccadillos but the material is not for criminal prosecution before the country’s courts. The dirt is used to control the officials, with public disclosure threatened should any try to go against the man they all call ‘father’, President Mugabe’s former deputy has revealed. And former vice president Joice Mujuru should know; when her own files were apparently partly unsealed, Zimbabweans heard all sorts – from witchcraft to allegedly sashaying half-naked while seducing a man she did not know had been sent to spy on her. “He keeps files on everybody,” Mujuru lamented to a British publication earlier this week. Her moan, in an interview with the UK’s Sunday Times newspaper, likely explains why Mugabe does not take action against ministers accused of corruption. Several cabinet members, among them Obert Mpofu and Ignatius Chombo, are multi-millionaires. Opposition parties and anti-corruption groups say the wealth may have been corruptly gained. Mujuru suggested that Mugabe holds evidence of his lieutenants’ transgressions but only uses the information to ensure they do not rise against him. 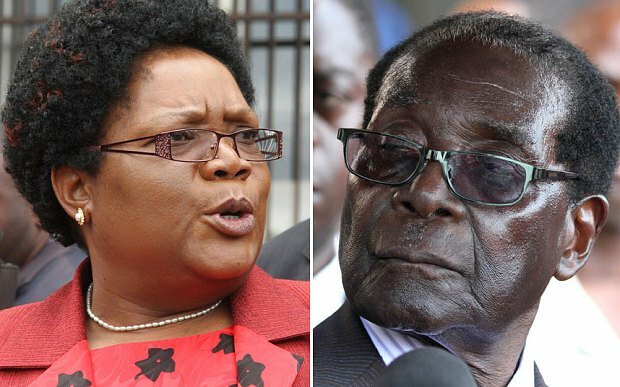 As they prepared the country for her brutal ouster from government and the ruling Zanu PF party, Mugabe and wife, Grace, accused Mujuru of grand corruption. It was claimed that she ran a blackmail racket through which she extorted 10 percent equity in private companies around the country. “She (Grace) saw me as a threat — they both did,” said the former VP. Mujuru did not say whether the allegations, which she has denied, came from her own files in the secret Mugabe vaults. It also remains unclear whether fear of further damaging revelations from is behind the former vice president’s measured criticism of her former boss. Mugabe’s wife Grace, who is being used to block current vice president Emmerson Mnangagwa succeeding her 92-year-old husband, has also threatened to expose the current VP. She told a recent rally at Chiweshe that Mnangagwa has “thousands” of children with numerous women around the country, warning she was prepared to reveal more dirt. Mujuru was however, scathing of Grace’s succession chances. “She’s just a housewife, a typist,” Mujuru said of the First Lady.